Connaught Public School has always been close to the hearts of the team in the Perioperative Program at Niagara Health's St. Catharines Site. For six years, the team has been donating to the school’s Breakfast Club Program at Christmas – going back to the days when they worked out of the former St. Catharines General Hospital, which is in the same neighbourhood as Connaught. The team was participating in Niagara Health’s Acts of Kindness Workplace Challenge when they came up with the idea to collect items like winter coats and boots, mittens, socks and non-perishable food for students at the school. In all, the team recorded more than 1,200 acts of kindness during the month. 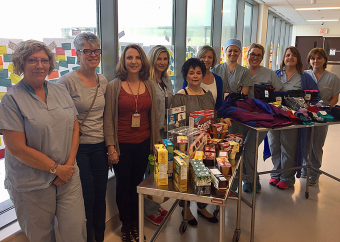 Collecting items for the school and recording other acts of kindness by members of the team was extremely rewarding for staff and physicians, said Jaelynne Sonke, Clinical Manager of the St. Catharines Site Perioperative Program, which includes the Operating Room and Day Surgery. Connaught Principal Kelly Diiorio said the school is grateful for the donation. So far, eight departments have completed our Acts of Kindness Challenge, resulting in nearly 7,000 acts of kindness.